AquaKinetic® Series – Commonwealth Water Treatment, Inc.
AquaKinetic Series water softeners are powered by the force of moving water, not electricity, so they’re economical and reliable. Where space is tight, AquaKinetic Series systems fit right in. 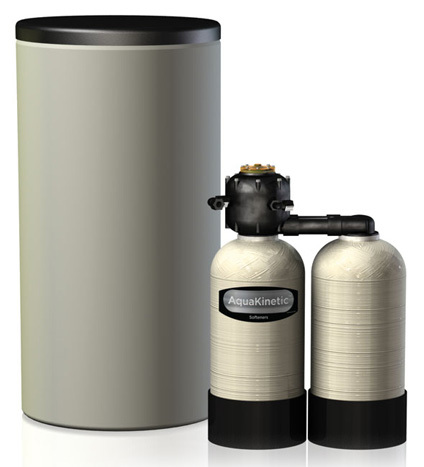 An AquaKinetic Series water softener monitors your water usage and regenerates only when necessary. Since regeneration is based on your actual water use, it will regenerate at any time of the day or night, but only when needed, which saves salt, water and money. Its two-tank design means you will have a continuous supply of soft water, even during the regeneration process. One tank is always in service while the other tank is either on standby or regenerating. on’t let the compact design of an AquaKinetic Series water softener fool you. It can provide you with soft, iron-free water for years to come.